Hit maker Dido starts things off with her sensitive, hook-laden radio pop ("Here With Me"), before Nettwerk recording artists Sense Field's "Save Yourself ("9.01 Version)" provides the appropriate follow-up with lush, orchestrated acoustic pop that will have you eating out of their palms. Things start to build up with Coldplay's "Brothers and Sisters", a smoky Brit-pop acoustic ballad, while Ash's sonic attack of rock on "Shining Light" starts to really make the lights flicker. Let's not forget Travis' "More Than Us". Or Sheryl Crow's "I Shall Believe," a heartwarming, lush pop song that will instantly make you fall in love. 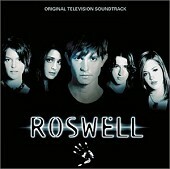 From well-respected indie bands to multi-platinum hit-makers, the soundtrack to Roswell has it all. What's more is this is a darn fine collection of beautifully crafted pop that will have even the toughest pop fans smiling. I'll give it an A.